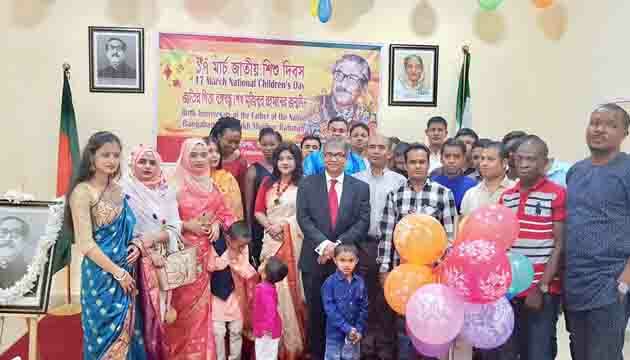 Bangladesh High Commission in Abuja, Nigeria celebrated 99th Birth Anniversary of the Father of the Nation Bangabandhu Sheikh Mujibur Rahman and National Children’s Day on 17 March 2019 in a befitting manner and with festivity. 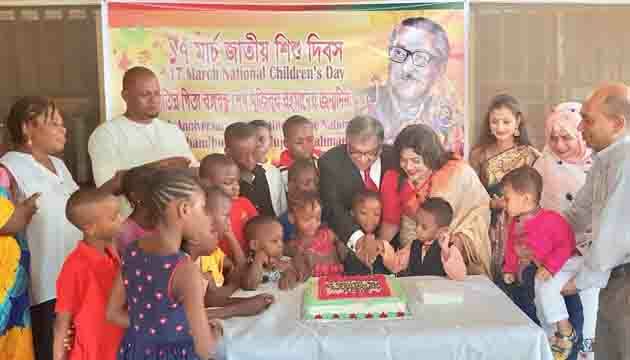 The first part of the Programme started at 5 pm with the cutting of cake with the orphans of the City of Refuge Orphanage in Abuja to mark birthday of Bangabandhu. High Commissioner Mr. Md. 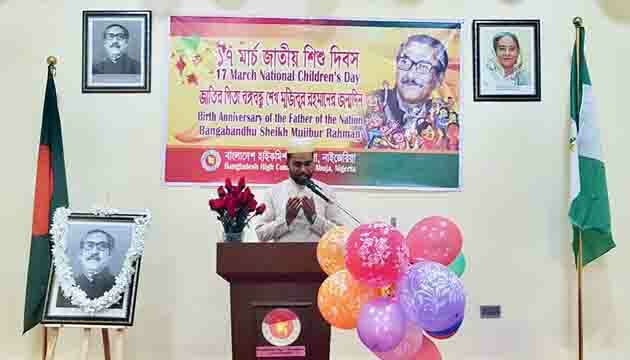 Shameem Ahsan,ndc made brief remarks on the love and affection of the Father of the Nation for children before the orphans and the Officials of the facility. Later, the High Commissioner handed over some food items and gifts to the Administrator of the City of Refuge Orphanage which was much appreciated by all. Mission’s officials including their family members and the Bangladesh community members were also present. The second part of the programme commenced at 7:30 pm at the auditorium of the High Commission which included placing of floral wreath at the portrait of Bangabandhu, screening of documentary, reading out of the messages of the President, Prime Minister, Foreign Minister and State Minister for Foreign Affairs, discussion, recitation of poem and special prayer, among others. In his welcome remarks, Mr. Md. 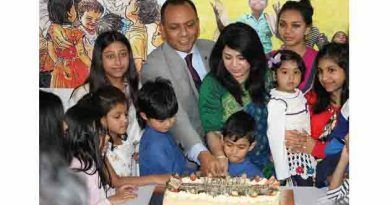 Shameem Ahsan,ndc, High Commissioner mentioned about the unflinching love and affection of the Father of the Nation for the children. He added that compassion that was evident in the character of Bangabandhu during his childhood shaped the fundamental trait of his political philosophy of later life and that was love for the people. 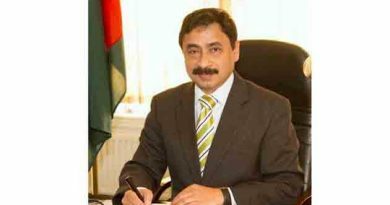 The High Commissioner also shed light on various initiatives taken by Bangabandhu and also by Prime Minister Sheikh Hasina for the welfare of the children. 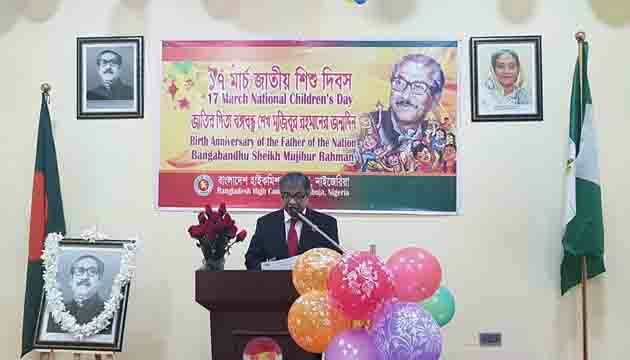 Mr. Ahsan also highlighted on the need for educating the children about the life and works of Bangabandhu. Members of the community also shared their thoughts on Bangabandhu’s role in the emergence of Bangladesh. Members of the Nigerian civil society,community members, tiny tots and their parents were present along with the officials and their families of the High Commission. 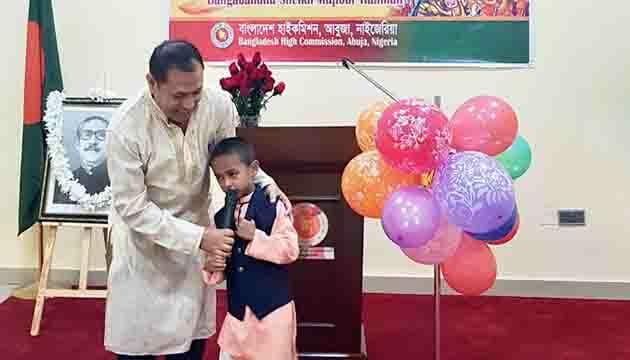 The auditorium assumed a festive look which was beautifully decorated with Bangabandhu’s portraits, posters, balloons, colourful paper-made chains and other glittering materials. The guests were served with traditional Bangladeshi cuisine.